A scannin electron microscope image o normal circulatin human bluid. 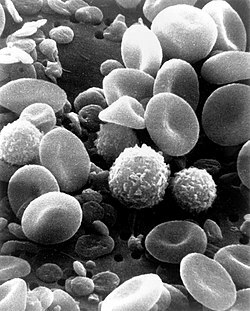 In addeetion tae the irregularly shaped leukocytes, baith reid bluid cells an mony smaa disc-shaped platelets are veesible. White bluid cells (WBCs), an aa cried leukocytes or leucocytes, are the cells o the immune seestem that are involved in pertectin the body against baith infectious disease an foreign invaders. This page wis last eeditit on 16 Mey 2015, at 01:56.